Let's Go Find Some Sharks from White Shark Video on Vimeo. ​Skyler Thomas is an award-winning filmmaker and shark advocate. 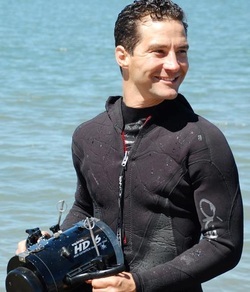 He holds three degrees, a dive master certification, and is currently pursuing a PhD in animal behavior. Skyler hosts his own educational shark series and is available for hire as hosting talent. All footage seen on his pages and in his episodes are Skyler's (unless otherwise noted) and are available for licensing. Skyler founded White Shark Video in 2009 and incorporated as a non profit education company in 2013. His work is self-funded so any donations to the company are greatly appreciated and help the continuation of his work. In 2014 Skyler wrote, filmed, directed, and edited Great White Lies which has won over 20 awards so far.